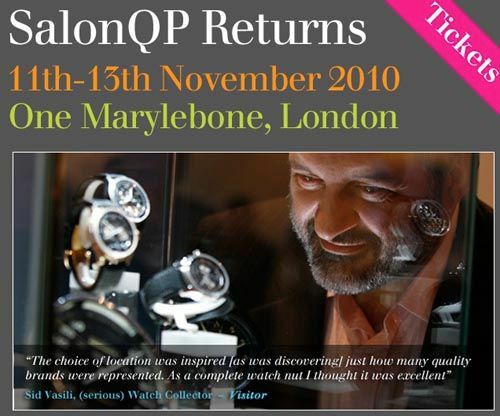 SalonQP 2010 Returns - Be There! SalonQP 2010 Returns – Be There! For the second time, London is having this great annual watch showcase called SalonQP. UK based QP magazine (devoted to fine watches) organizes this event for watch collectors and enthusiasts on November 11, 12 and 13. The line-up of exhibitors is impressive and includes (a.o.) A.Lange & Soehne, Bremont, BRM, Cartier, Daniels London, Graham, Grand-Seiko, Jaeger-LeCoultre, JeanRichard, Linde Werdelin, Montblanc, Nomos, Oris, Panerai, Perrelet, Roger Smith, Vacheron Constantin and Zenith. A programme of lectures, workshops and debates will be announced soon on the SalonQP website. The event is being held in the private and luxurious atmosphere of Sir John Soane’s historic One Marylebone in London. You can order your tickets by clicking here. I am looking forward to attend this meeting, and so are my colleagues from aBlogtoRead, Hodinkee and the Dutch based HorlogeNieuws.nl. Friend of the Fratellowatches blog, Linde Werdelin, already made a video presenting the two watches they are going to show you during this event. Follow SalonQP on Twitter and Facebook as well.